In my recent blog, titled “Paving the way for digital identities and mobile eGov access”, we discussed some of the trends driving the expansion of online access to government services, and noted the importance of using secure login technologies to make online access safer and more convenient. In particular, we talked about how a digital ID, called a derived credential, can make the online login process safer, more flexible, and more citizen friendly. In this blog, we take a closer look at what derived credentials mean for an increasingly important subcategory of online government services – mobile government. Mobile government, which is sometimes referred to as mGovernment or simply mGov, is a rapidly expanding segment of online government services. It refers to the use of smartphones and other mobile devices, running mobile apps or using mobile web sites, as the access point to government information and services. The growing presence of mobile devices in everyday life, has led local, state, and national governments to use mGov as an access channel to reach citizens and as a new way for citizens to reach government. Mobile devices enable government-to-citizen transactions, such as benefit payments, and can increase citizen participation by letting people provide input to political decision-making, including voting via mobile phones. The use of mobile devices can also improve the internal operation of public agencies, since it makes information easier to access and keep up to date. It’s important to remember that mGov isn’t a replacement for other services, but can be a strong addition to eGov programs that are already in place. Similarly, the credentials used to access eGov/mGov services are not substitutes for traditional physical ID documents, such as birth certificates, driver’s licenses, or marriage certificates. Physical documents remain the foundation of all government services – online or off – and remain the root credentials in case there are any problems with the network infrastructure associated with eGov/mGov services. As a new subsegment of eGov, mGov faces many of the same challenges associated with any emerging application. Perhaps most prominent among these are the issues of cost, scope, and trust. Cost – mGov applications tend to be viewed as one of many eGov channels that need to be developed, so they often have to compete for their share of funding. At the same time, mobile government can lead to more efficient administration process and save cost for governments and time for citizens. Scope – the fact that a single derived credential can be used for access to multiple eGov services (as well as private-sector services) makes it important to define the scope of the project before moving ahead. The aim may be to support multiple use cases, but it might not be feasible to develop everything at once. The architecture and use cases for the initial rollout, and any follow-on additions, often depends on several factors, including budget, the in-place infrastructure, and the involvement of various public and private stakeholders. Trust – any mGov application that supports transactional public services, especially those that involve tax-payer funding and other forms of public budgeting, must use the right level of security, and must gain the trust of everyone involved. One question to be considered is how the derived credential is stored, since there can be differences in the way specific SIM cards and embedded Secure Elements (eSEs) manage security, and because the formats supported by mobile network operators (MNOs) can differ, too. Another consideration is whether the stored credential will comply with the necessary standards, such as the EU regulation for electronic IDs, known as eIDAS, which became a legal requirement throughout the EU as of July 2016. These questions also have cost implications, since the choice of storage technology and format often impacts the budget, too. To build trust within the stakeholder community, a rigorous development program, focused on the proper configuration of security mechanisms and supported device makers, can serve as evidence that the mGov program will meet the necessary requirements. Other government initiatives, including legislation to govern the proper use of mobile credentials, and communications campaigns that explain how security is managed by the mGov application, can help address end-user concerns and build trust, too. One thing that makes it easier to address the primary challenges of cost, scope, and trust is the use of proven and verified security technologies, such as electronic IDs (eIDs). The use of standardized, time-tested eID formats helps lower development costs, makes the deployment easier to scale, and increases stakeholder confidence. The specific eID approach we recommend is to use a credential that is based on, or derived from, a primary credential. A primary credential is a form of identification issued on the basis of presenting a physical breeder document, such as a birth certificate. A national ID card, for example, is considered a primary credential, since it’s issued only after the citizen has passed a well-established process of identity proofing. Using a primary credential as the source of the derived ID, the “root ID” is then held in a secure document. Additional IDs, derived from the root ID, can be generated for various end-user devices, and can be stored either locally, in the device itself, or remotely, in the cloud. Support for a broad range of devices helps maximize mobility for the most people, and adds convenience with inherent compatibility across devices. In the world of identity and access management, the level of assurance refers to the degree of confidence that a credential is neither fraudulent nor stolen, and that the person using the credential is the person to whom the credential was issued. When granting access to any government service, the level of assurance needs to meet the requirements of a given use case. A low-risk transaction, for example, is likely to require a lower level of assurance than a high-risk one. The security mechanisms supported by an authentication platform typically dictate the level of assurance, and provide a starting point for balancing the tradeoffs involved with risk, complexity, and cost. Using digital credentials derived from smartcard eIDs creates a smooth transition to mobile formats. 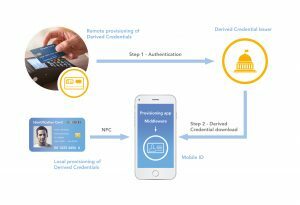 The mobile credentials are compatible with existing contactless smartcard infrastructures (including those that use MIFARE or NFC), and can be authenticated using in-place methods. The mobile device can quickly become an extension of in-place smartcard eID programs that already support things like user authentication, signing and decrypting email, physical building access, or in-store and internet payments. At NXP, we’re using our experience with eGov solutions to help drive development in mGov. We’re working on a new service platform that will provide the necessary infrastructure for digital authentication, including support for derived credentials. We believe that, by using eID hardware as a starting point, it will be easier to design and deploy secure authentication services for mobile applications, and it will be easier to migrate multi-application eID operation into the mobile space. Once the secure, verified framework for derived credentials has been put in place, government agencies can move quickly to reap the benefits of mGov services. As one might imagine, given the flexibility and security made possible by derived credentials, the number of applications is expanding rapidly. We will address these new opportunities in our next blog.